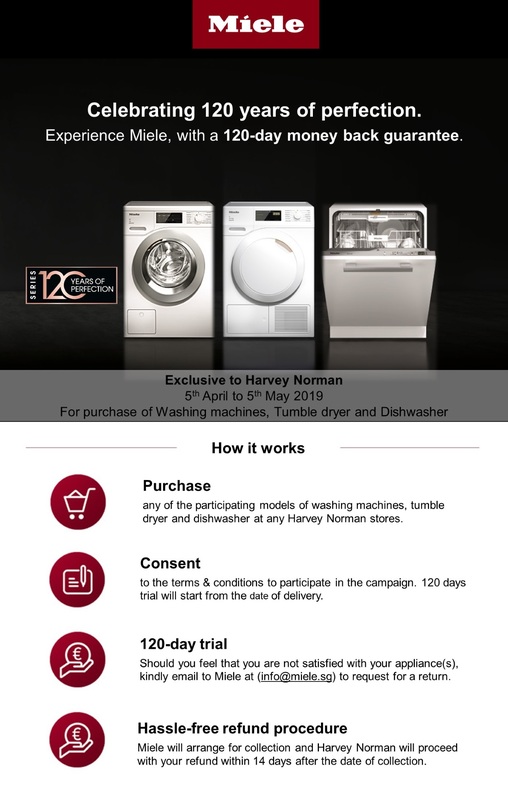 This 120 days money back guarantee campaign ("campaign") is valid from 5th April 2019 to 5th May 2019 on Miele washing machines, dryers, washer-dryers and dishwashers("participating products"). Only participating products purchased from Harvey Norman in Singapore will be eligible for the campaign. Display products and warehouse sale items are not applicable to the campaign. Delivery has to be completed on or before 31st December 2019. Participating products delivered after this date will not be eligible for the campaign. This 120 days money back guarantee campaign will be effective starting from the day of delivery, with the delivery date being the first day. Within 120 days from delivery, in case consumer is not satisfied with the participating product, he/she can send an email to Miele (info@miele.sg) to request for return by stating the reason(s) of return and attaching a copy of purchase invoice. The return request will not be accepted if consumer fails to produce the original invoice of purchase upon request. Return of participating product will be accepted only if there is no damage (including, but not limited to cosmetic damage such as scratches or dents) and the product is well maintained and used according to the usage prescribed in the Operating Instruction Manual provided along with the products. For return which is accepted, an admin fee of SG$ 250 inclusive of uninstallation and transportation will be deducted from the invoice amount and the balance amount will be refunded to the consumer by Harvey Norman. The balance amount shall be paid to the consumer within 14 days of return of the participating product. Miele Pte Ltd reserves the right of final decisions in cases of disputes.